Without consistent oral hygiene, the gums can easily develop what is called periodontal disease, which you likely know as gum disease. Early symptoms can consist of red, swollen, and tender gums that bleed often, but over time, it can eventually lead to loose teeth and even tooth loss! 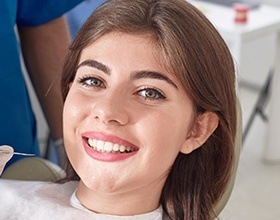 Dr. Steven Feit and our team seek to protect our patients’ entire smiles, not just their teeth, which is why we provide a number of treatments specifically designed to fight and prevent periodontal disease. If we’re able to catch a patient’s periodontal disease relatively early, we can most likely take care of it with a scaling and root planing treatment. Think of it as a dental cleaning that is focused specifically on the gums and roots of the teeth. 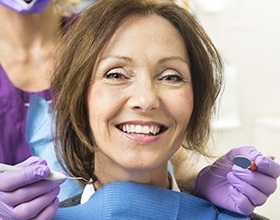 Our expert hygienist will first use an ultrasonic cleaner to remove any built up plaque and bacteria from around the gum line (scaling), and then they will smooth out the rough surfaces of the tooth roots (root planing). Why do this? This makes plaque less likely to gather along the gums in the future, lowering a person’s risk of reinfection. We also have other techniques to help those who dislike the ultrasonic cleaner, just let us know. After an initial periodontal cleaning, we may apply a topical antibiotic to the gums in order to eliminate any remaining bacteria that is hidden deep beneath the gum line. Arestin, which looks like a powder, actually consists of thousands of tiny microspheres, each one filled with a powerful antimicrobial agent. On the gums, it dries quickly and then slowly dissolves over the course of a few days, enabling the medicine to reach and kill any leftover bacteria.